Seri Selangor has consistently bedevilled me despite playing there a thousand times. I have only broken 90 once there, and my average there generally hovers around the high 90s, with occasional explosions into the 100s. This year, I played it four times, with the score, 97, 99, 96 and 97. Yup, that’s around 97.25 score, almost 11 strokes more than my average at Mines. There is a reason. Seri Selangor is damn. Hard. The greens are devilish, the fairways are tight and the jungle is unforgiving. It’s like the death star, Bobba Fett, Emperor Palpatine and Darth Vader rolled in one. The most recent game I played, I had the worse 9 hole score ever in Seri Selangor. I teed up at the easier front 9 (easier because generally the fairways are wider). However, my driver was horrendously out of sync. My first triple at hole 4 was a bad drive that skittered 60 meters, and a 3 wood to the right, and then a pull to the left. I decided to putt up the green and it didn’t even make it. Stupid. On the back to back par 5s, I actually dunk my shots in the drink – my second for Hole 5, and my drive for Hole 6 but yet managed to carve out bogeys on each hole thanks to some luck and good irons. I tripled Hole 7. It is by far the worst hole I ever encountered, a tight uphill drive with OB right and left, and a narrow fairway to hit and a crap hard green to hit. I average almost a triple bogey for that hole for the 4 times I played there. But then when I made the turn, I made two adjustments. I didn’t give a sh*t anymore and just dumped my 3 wood and decided to use driver all the way from the tee, and secondly, I shortened my driver significantly, holding it almost at the beginning of the grip, near where the grip meets the shaft. And I drove perfect. The two drives I missed the fair way on 16 and 17th were perfect drives that rolled too far and nestled just a bit in the rough and I parred both. The two triple bogeys were from great drives, but just lousy approaches that ended up either in the bunker or woods which I proceeded to have a short game meltdown. The final hole I went for green in two and just pulled it a bit into the water. Final 9 was 5 pars, 2 triples, 1 bogey and 1 double for a 45. 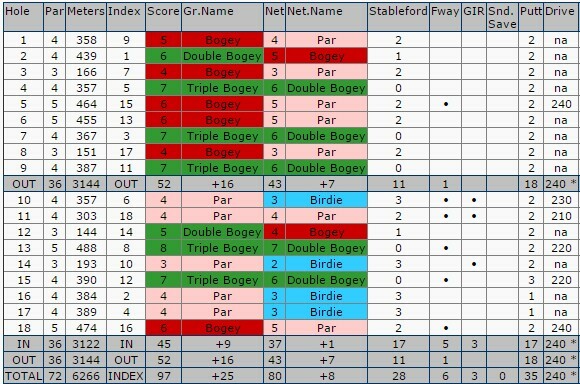 It could have been much much better but it was the best score I ever shot for a 9 hole at Seri Selangor for a long time. 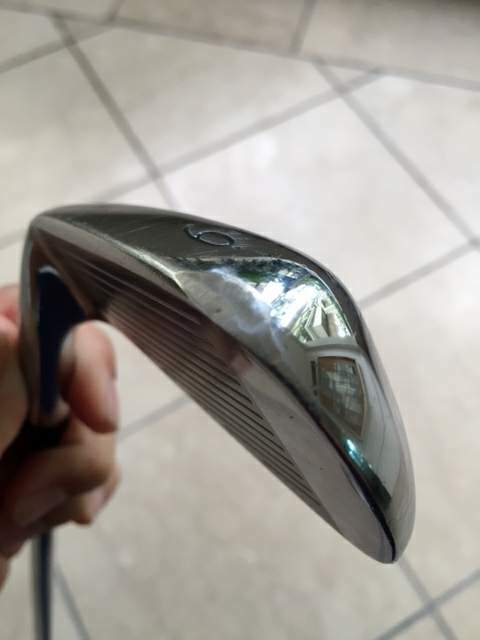 Oh, I also had my six iron buffed out. It looks bad, but not as horrible as previously. Got it done by a guy named Shan at the KLGCC repair shop.